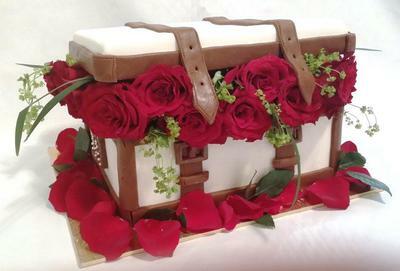 The cake was made of vanilla pound cake and chocolate pound cake, filled with chocolate ganache, and strawberry buree, covered with vanilla butter cream and then covered with white fondant, the laces was made of chocolate fondant, the roses are real red roses. This cake is so pretty, I love it. YOU DID AN AMAZING JOB. IT LOOKS SO REAL AND I WOULD NOT WANT TO CUT INTO IT. VERY BEAUTIFUL! !